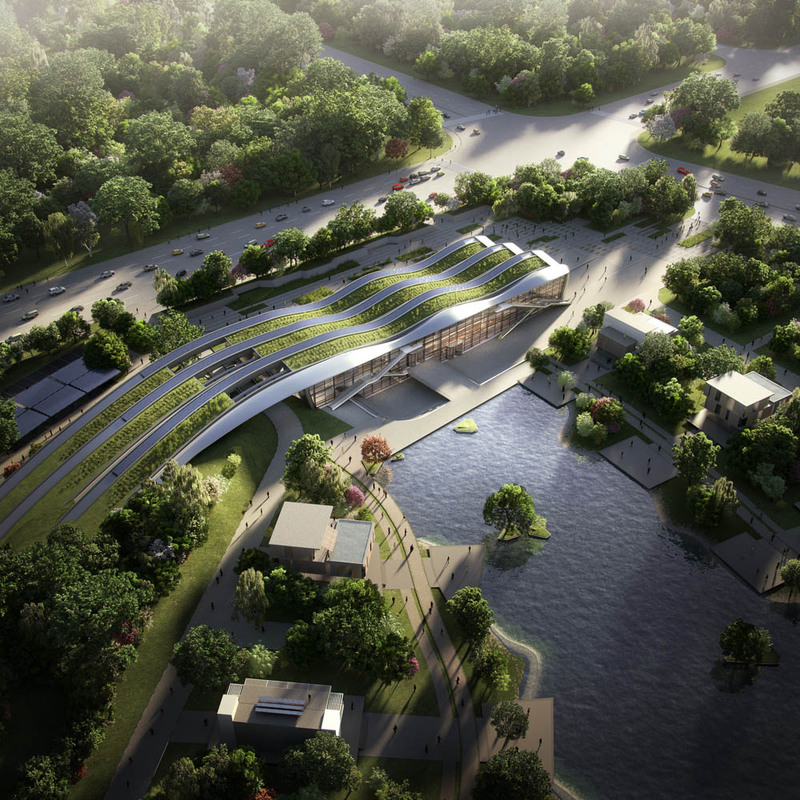 The Beijing Green Building Park Visitor Centre is the Centrepiece for the new Demonstration Park. The aim is to create an environmentally sensitive building in harmony working in union with the surrounding landscape. The BREEAM Outstanding building will become a new experience and education facility for the young and old of an ever changing Beijing. The building’s undulating form is a direct response to the landscape setting whilst also serving an internal practical purpose meeting the requirement for a variety of different room heights. The buildings structural solution is a steel frame superstructure with in-laid precast concrete radiator panels. These panels provide heating and cooling to the spaces depending on the time of year. High level glazing provides both the opportunity for natural ventilation but also permits natural light into the spaces – a direct contribution to the low energy credentials of the project. The exhibition spaces themselves are flexible and adaptable to cater for ever-changing internal reconfiguration requirements. The building is designed to BREEAM outstanding where new ways of interactive learning are on display. As an example, in the cafe space, the Biofuel plant room is on full display for the public to visually understand the engine that powers the building and as such showing the inner workings of the building to the public.